I want the payment to be handled by Goldman Sachs. You will send a deposit to Goldman Sachs and they will keep it until you will receive and inspect the car. You will have a 5 days inspection period. 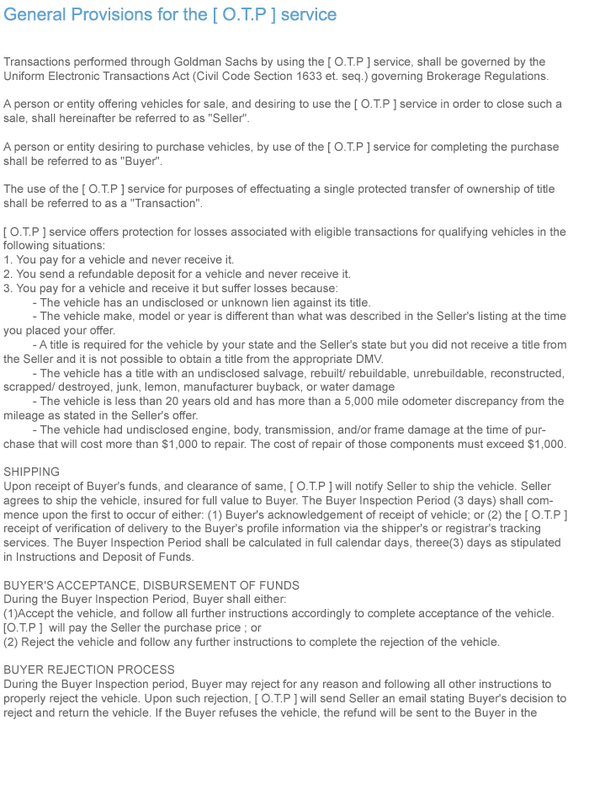 If the car is not as described it will be shipped back on my expense and they will give you a full refund. This way, you will be able to inspect the vehicle before committing to buy it and I know that you have the money and you aren't just fooling around. Giving the nature of this transaction please note that my sale terms are final and nonnegotiable. In order to move forward and register the transaction with Goldman Sachs I will need your full name, address and phone number for the shipping, after that they will contact you with the payment instructions. I don't want to offend you, but the car is priced for a fast sale so please if you intend to apply for a loan or financing do not reply to this message! Sorry for the delay .Yes, the issue has been fixed and I never had any problems with it since . You will deposit $2500 to Goldman Sachs and they will keep the money until you receive and inspect the car. You will have a 3 days inspection period. If the car is not as described ,you will ship it back to me and Goldman Sachs will give you a full refund. This way, you will be able to inspect the vehicle before committing to buy it and I know that you have the money and you aren't just fooling around. Giving the nature of this transaction please note that my sale terms are final and non-negotiable. In order to move forward and register the transaction with Goldman Sachs I will need your full name, address and phone number, after that they will contact you with the payment instructions. I don't want to offend you, but the car is priced for a fast sale so please if you intend to apply for a loan or financing do not reply to this message! The car is still available, I am located in Phoenix, AZ, the car is in exceptionally good condition, no previous accidents or any kind of damage. Please check the carfax the VIN number is ( WBAWL13569PX24792 ). I have lowered the selling price to $18,000 .I'm a pilot on cargo flights, my wife broke up with me recently because I'm always away from home. We just sold our house and split the money. This is the last thing I need to sell and split the money with her. Because I'm away most of the time I will not be able to deal in person, but I've already arranged the shipping and the title transfer anywhere in the US. I will pay the shipping fees. ..I'm a serious seller and I'd prefer to deal only with a serious buyer as well.. If you are interested please email me back so I can explain how we can proceed further. PS: Here you have some photos with the car, hope you like it. The lien is paid and now the title is clear, no liens or loans on it . 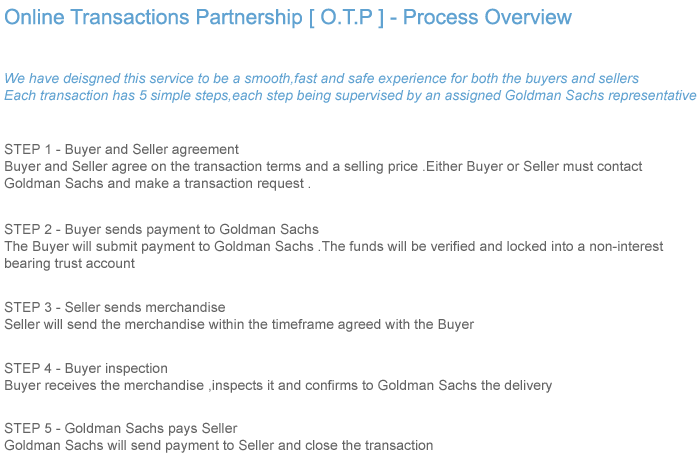 I want a fair transaction and I suggest we make the sale through Goldman Sachs OTP service - http://goldmansachs-otp.zzl.org/financial/automotive/services/ .You have to know that once you received it you will have 3 days to test-drive/inspect it and if you find that it's not like I said,you can send it back on my expense...but I'm sure that wont be the case...After starting up the transaction at GS , you will make a first payment to them, in order to have the shipping started. After they check the payment they announce me to start the shipping.After you will receive the car and see that everything is ok with it, you have to announce them that you have it and you will send them the remaining balance.Only then, GS will send me the money. In order to begin the deal,please email me your full name,shipping address and a phone# in order to open the case at Goldman Sachs and they will contact you with all the information you need.If you agree with this I will call you to answer any questions you have and to establish all details. The car is still available, I am located in Little Falls, NJ, the car is in exceptionally good condition, no previous accidents or any kind of damage. Please check the carfax the VIN number is ( JTHBP262485001190 ). I have lowered the selling price to $20,000 .I'm a pilot on cargo flights, my wife broke up with me recently because I'm always away from home. We just sold our house and split the money. This isthe last thing I need to sell and split the money with her. Because I'm away most of the time I will not be able to deal in person, but I've already arranged the shipping and the title transfer anywhere in the US. I will pay the shipping fees. ..I'm a serious seller and I'd prefer to deal only with a serious buyer as well.. If you are interested please email me back so I can explain how we can proceed further. Have any information on this scam? 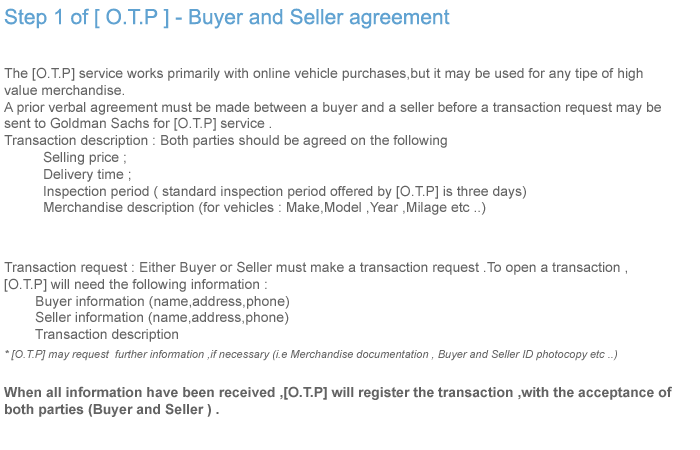 The scammers mention the term O.T.P meaning Online Transaction Partnership. 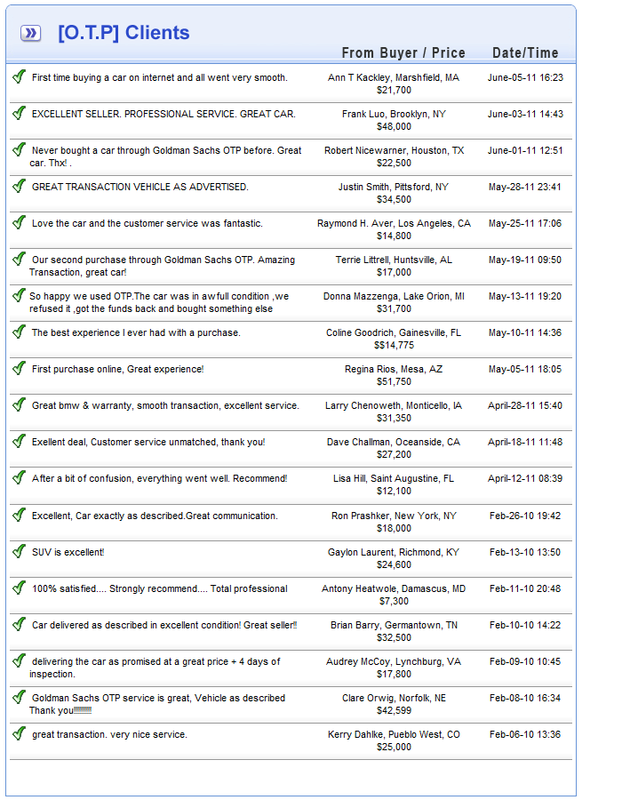 The scammers are apparenlty listing autos on the internet.